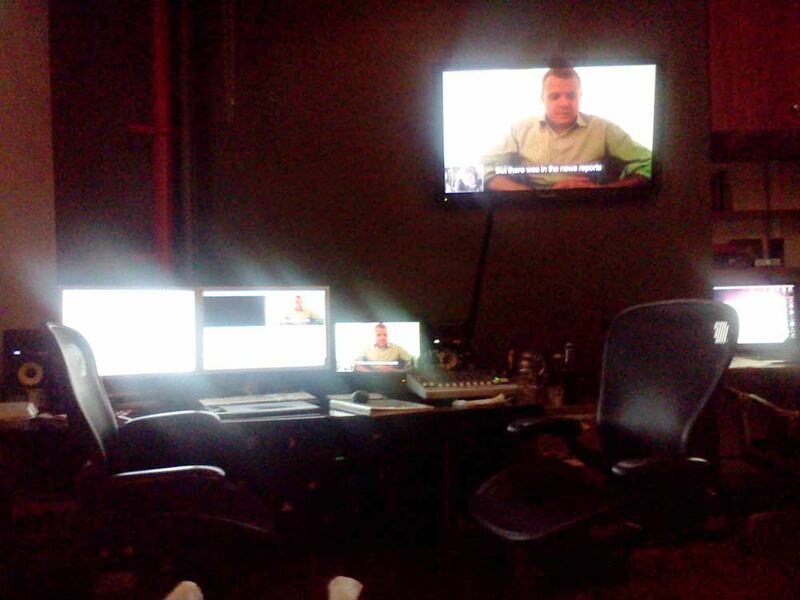 Michael Equi, hard at work in an editing suite on “16 Photographs At Ohrdruf.” November 2011. Every Christmas for the last decade, I’ve spent part of the holiday with Michael Equi and his family. To me, they are my family too. Mike (I may be the only person who still calls him that) introduced me to my wife. We studied together at the Museum School in Boston in the ’90s and became friends while I was a fan of his band, Fun In The Kitchen. Now that we are older, Mike has established himself as a respected professional editor at Fluid in New York. 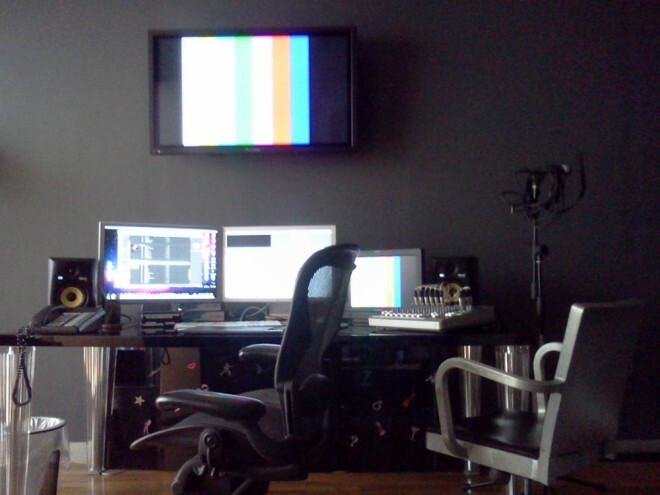 Michael Equi, hard at work in an editing suite on “16 Photographs At Ohrdruf.” February 2012. During the early phases of 16 Photographs At Ohrdruf and before I’d shot a single frame, I asked Michael if he would edit the film. I knew he’d say yes; I also knew that we were both realistic about the possibility of this actually happening. It was a big project, and I was making a HUGE BET that I could pull it off. Michael was doing what good friends do and agreeing to help, supporting me and hoping for the best. In the two intervening years, Michael has been the unequivocal editorial voice for this film. Our first “official” production meeting was in October 2011 when I presented the first rough cut of the film at Fluid in NY. In the room were Michael and I, along with my partner and producer Jason Dean and Fluid’s VFX artist Daniel Ratcliff. The rough cut was 90 minutes long and at the end I remember taking notes as the team made their comments. It was tough to hear, some of the comments were very critical, but everyone saw the skeleton of a great project and wanted to make it work. 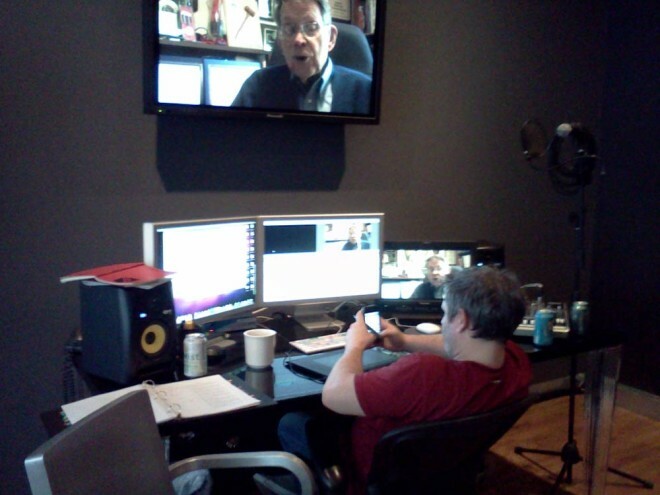 Michael Equi, hard at work in an editing suite on “16 Photographs At Ohrdruf.” April 2012. After that tough meeting, Michael and I worked hard on a series of notes that resulted in a whole new script. I spent the month of January 2012 re-writing the story, and the late-winter editing alone and with Michael to make it happen. By March 2012 we had a solid story… but I still wasn’t happy. Michael encouraged me to fill in some of the sections with more in-person interviews. In April of 2012, on my birthday, I flew to Chapel Hill NC to interview Bob Patton of the 65th Infantry Division. This interview was the last addition to the film story; a few weeks later I would re-shoot the medic scenes in a Boston park whose starkness matched an April Germany at Ohrdruf… the last shoot of the film. Fine-cutting is a process for which I have no patience, and I have been amazed at the incredible detail and precision that Michael has brought to the film. He also oversaw the work of Danny for the VFX, which include the flying maps and overlays throughout the film. Later, as we neared the end of production, Michael brought in and worked with the incredibly talented David Wolfe at Mr. Bronx who did the final audio mix. As I type all of this, the Oscars are on the TV. Yes, actors and stars are great, and powerful stories are vital. Yet, even on my small film that I know will never put me on a red carpet I think it is important to recognize the people who really made it happen. 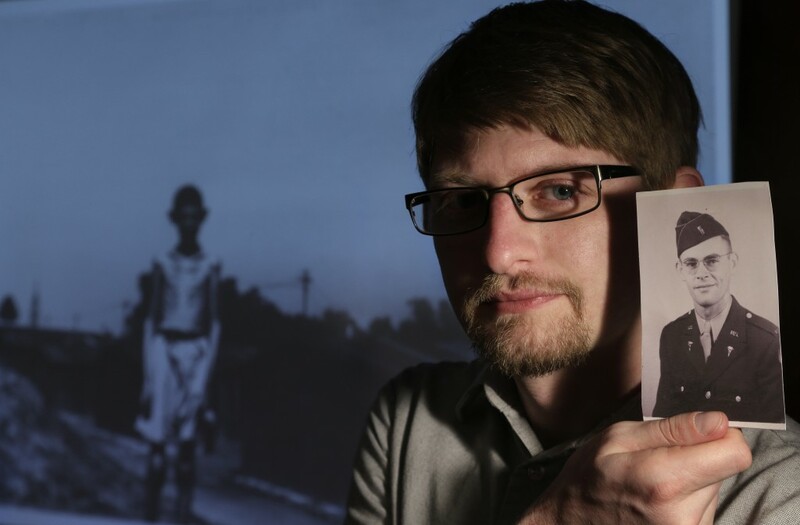 There is no 16 Photographs At Ohrdruf without Michael Equi, Jason Dean, Danny Ratcliff and David Wolfe. Period. End of story. If you can find a few bucks to support this film, you are supporting people who make art because they believe in the story they are telling. No one asked for a penny, so it falls to me to ask on their behalf. Click here to donate in support of this independent film.